The party lives on! After wrapping up the annual KarJenner Christmas Eve bash, Kim took her daughter sledding in the leftover snow. Take a look! Kim Kardashian, 38, doesn’t just know how to throw a party — she knows how to end one, too! After an epic bash at her and Kanye West‘s place on Dec. 24 to ring in Christmas, the mother of three took her oldest daughter North West, 5, outside to keep the fun going. Since their festive bash turned their mansion into a winter wonderland, it would only make sense to take advantage of the leftover snow, right? And that’s exactly what this sweet mother/daughter pair did, recording their sledding sesh on social media. “Alright guys, Merry Christmas,” Kim said from behind the camera. “We’re gonna go play in the snow. It’s still here and we’re gonna go sledding.” But before they hopped on, the reality star showed off her daughter’s party merch. North was dressed for the snow in black sweats and boots, as well as a long sleeve that said “Naughty” on the back and “Or Nice” on the front. Her mom was wearing plaid green PJ pants, which could be seen when the two settled onto their sled. They screamed the whole way down! But that wasn’t the first time that Kim had gone sledding this season. At the party, she’d hit the slopes with old pal Paris Hilton, 37. Even Kendall Jenner, 23, rode down the hill in a green gown with Tyler the Creator, 27. We’re so glad little Northie got to join in on the fun! 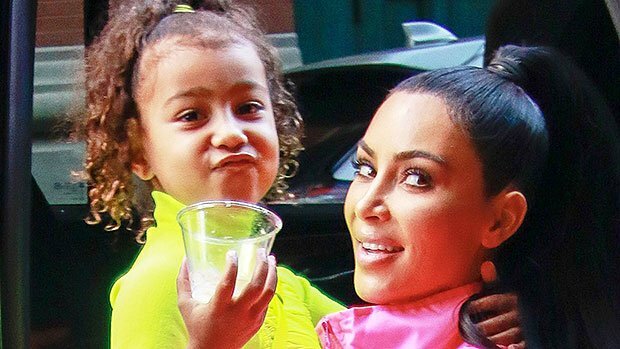 Since her brother Saint West, 3, was born in 2015, and her 11-month-old sister Chicago West entered the picture this year, we bet she loves one-on-one time with her mom now more than ever!